The Blue Seventy Helix has for years been one of our favorite triathlon wetsuits on the market, at any price range. We try to be as impartial as possible but we know a great wetsuit when we see it, and the Helix fits the bill. Best of all, it just keeps getting better. 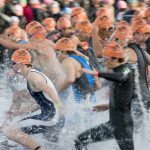 Blueseventy, along with Orca and Xterra, has been pushing the envelope in recent years on what a good triathlon wetsuit should be able to do. While each of those manufacturers make a high-end wetsuit that we would be happy to race in, the Helix is a cut above in enough respects to make it our favorite. While it is not a cheap wetsuit (it retails at over $700 and is often difficult to find on sale), it is an excellent investment if you plan to race for several years, or are training often in open water and want to be as fast and buoyant as possible. When it comes to specs, the Blue Seventy Helix offers five distinct Neoprene paneling thicknesses, putting it right at the top with the best range of density variation in the business. Examining the Helix up close shows how well Blue Seventy has woven those five panel thicknesses together, and given key areas like the shoulders and chest just the right range-of-motion for swimmers who will be using the suit often or racing in long races. While all of the high end wetsuits allow racers to alter their swim stroke far less than they would in an entry-level wetsuit, the Helix does a great job of blending the thicknesses together with high quality seams. The Aerodome rubber Neoprene is a high tech as anyone is making these days, on par with the 40 cell yamamoto neoprene that we have seen from other makers — wetsuits like Orca feature the 40-cell Yamamoto. Blueseventy also makes a Helix tailored especially for a woman’s frame. 5mm neoprene is used thoughout much of the wetsuit, providing excellent buoyancy. Blueseventy likes to say it allows for more of a “downhill” swim experience. We like the thinner, flexible center breast panel which allows for more flexibility throughout the chest area. Anyone who has used a “too-stiff” wetsuit knows how valuable this flexibility can be both from a physical as well as mental standpoint. Blueseventy also uses a “reverse zipper” on the Helix, which is exactly what it sounds like. Instead of pulling it up for the zip shut, you start at the top and pull it down. This allows for a more comfortable swim and, with a little practice, likely a fast T1 exit. Swimmers who test the Helix report that the great paneling technology not only provides the range-of-motion they need to maintain their swim stroke, but they also ride higher in the water because Blue Seventy has strategically placed paneling for the best body positioning. Swimmers also report that the reverse zipper that is featured on the Helix creates more comfort while racing and a quick transition motion, although the zipper can take a bit of getting used to if you grew up with a traditional zipper. With the thin paneling in some spots, you will want to be careful about getting nicks and cuts in this suit. If you need to store your wetsuit in an area where it won’t get the care that it deserves, you may want to consider a lesser suit that will be just a bit slower and less comfortable. Blueseventy is one of the only manufacturers to make a special model of its top-line wetsuit for ultra-cold environments. The Thermal Helix swaps the lightweight liner out for a mid-weight zirconium liner, allowing for more heat retention during the swim. With this modification, Blueseventy says that the Thermal Helix can keep a swimmer comfortable in temps town to 48 degrees F (9 C). That is extremely cold, and this is a modification that likely is of interest to those doing northern ocean swimming as well as those in northern climates. While the wetsuit will keep your body warm, you will still have to deal with your head, feet, and hands! While we try not to spend too much time analyzing appearance, the Helix is a good looking wetsuit as well. The black neoprene is accented with blue and some very subtle orange striping that follows paneling variations. The result is a wetsuit that stands out in the sea of black as you are about to enter the water. The Helix’s price point, at about $800 on the standard Helix – $850 on the thermal – (we sometimes have access to it for less), is at the high end of any triathlon wetsuit. Most major manufacturers, however, tend to have their high end wetsuit priced in that range. We believe the intricate neoprene paneling, Aerodome consruction, and fast removal of the Helix make it worth the extra money for many racers. If you need to compare to another wetsuit on the market, the Xterra Vendetta is probably the closest thing we see to it the Helix out there. Both are excellent choices and intended for racers who have a healthy budget or are taking the sport quite seriously.